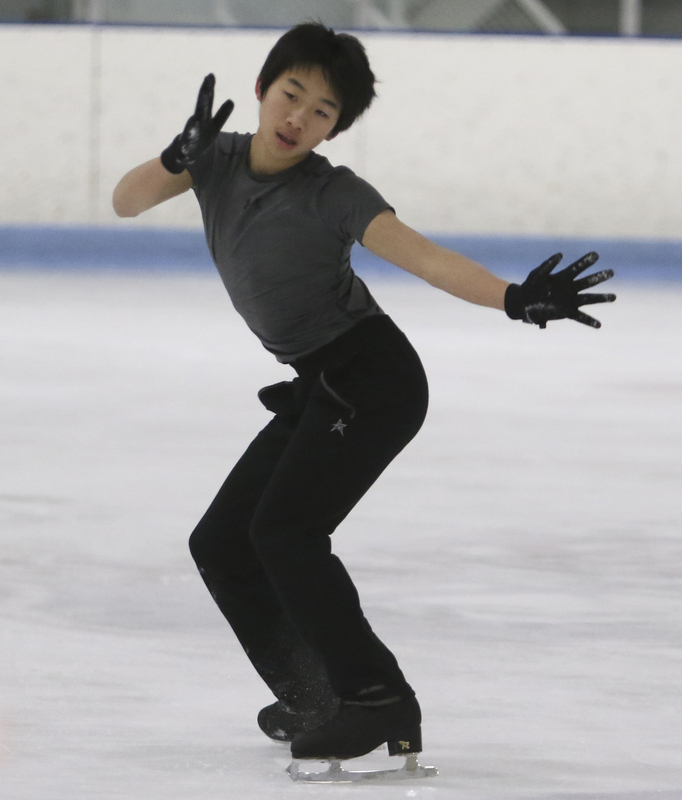 One of those who may be competing with Olympic champion Yuzuru Hanyu when he goes for his second consecutive gold medal at the 2018 Pyeongchang Games in South Korea is American junior champion Tomoki Hiwatashi. Hiwatashi, who was born to Japanese parents in Englewood, New Jersey, in 2000, marked his 16th birthday last week by capturing the U.S. junior crown in St. Paul, Minnesota. Hiwatashi, who was the focus of a recent feature in the Daily Herald, a suburban Chicago newspaper, boasts an impressive resume at a young age. His junior title marked the fourth time he has topped the podium at a U.S. national event. In 2011 he was the country’s juvenile champion, in 2012 the intermediate champion, and in 2013 the novice champion. Hiwatashi, who landed seven triple jumps in his winning free skate, is coached by Russia Alexander Ouriashev, who previously trained Gracie Gold at the same rink in Glen Ellyn, Illinois. The path to skating glory began at age 5 for Hiwatashi, who was signed up for skating lessons at the rink near his house by his parents. Hiwatashi finished third at the Junior Grand Prix in Croatia this season, after placing fifth at the JGP in Colorado Springs. Focus on training: Three-time world champion Mao Asada’s decision to skip the Four Continents in Taiwan next month to concentrate on practice is an interesting one. Ice Time is not sure he sees the wisdom in the move. After struggling with her triple axel in the last three competitions she entered (NHK Trophy, Grand Prix Final, Japan nationals) this season, it would seem that more competition — not less — would be better for Mao. It appears that the real reason Mao has withdrawn is that she was exhausted after the three events staged so close together. She had the stomach flu at the NHK Trophy in Nagano and it was said to still be bothering her when she finished last at the GP Final in Barcelona, Spain. This sounds like it is more about rest than practice. By electing to pass up the Four Continents, Mao will now go three full months without participating in a competitive event before the world championships in Boston in late March. Skating in practice is fine, but the reality is that you can’t duplicate the pressure and adrenaline there that flows when something is truly on the line. Two-time national champion Satoko Miyahara and Rika Hongo are going to the Four Continents, as are U.S. champion Gold, 2014 Olympian Polina Edmunds and former U.S. champ Mirai Nagasu. That level of opponents dictates that Mao should be there as well. Kanako Murakami will take Mao’s place in Taipei. With all of the progress in the physiology of sports in the past couple of decades, the ins and outs of how skaters train has always been a bit of a mystery to those not in the inner circle of the sport. Figure Skater Fitness (www.figureskaterfitnessmag.com), which launched last October, looks like a valuable resource for anyone interested in becoming a better skater. Three-time world champion Patrick Chan is on the cover of the January issue. Joining the stable: IMG announced earlier this month that it has signed world silver medalist Satoko Miyahara to a contract to represent her. Miyahara is now part of the team that also includes Mao and tennis superstar Kei Nishikori. New bid for worlds: The Japan Skating Federation is planning to bid for the 2019 world championships, Jiji reported on Monday. If Japan is successful, it would mark the seventh time it has staged the global event. Japan first hosted the worlds in 1977 in Tokyo, and did it again in 1985 (Tokyo), 1994 (Chiba), 2002 (Nagano), 2007 (Tokyo) and 2014 (Saitama). The 2011 worlds were set to be held in Japan but moved to Moscow following the Tohoku disaster. Telling it like it is: Best-selling skating writer and USA Today columnist Christine Brennan wrote an incisive piece on the decline of skating’s popularity in the U.S. last week. It is indeed a sad time for a country that used to be a powerhouse in the sport. A couple of key points cited in Brennan’s column included the fact that in 1996 skating had a higher TV rating (10.1 to 8.8) in the States than the NCAA basketball tournament, and that the women’s short program at the 1994 Lillehammer Olympics (shortly after the attack on Nancy Kerrigan) drew a massive 48.5 TV rating, which made it the sixth-highest-rated TV show in U.S. history. Brennan blamed much of the reason for the current lack of interest in skating in the U.S. on the confusing scoring system and dearth of American stars.